UPDATED: Sat., Oct. 7, 2017, 11:11 p.m.
Sam Darnold threw for 316 yards and three touchdowns, Ronald Jones II rushed for one touchdown and No. 14 Southern California defeated Oregon State 38-10 on Saturday in Los Angeles. Wide receiver Tyler Vaughns and tight end Josh Falo each caught their first career touchdown reception from Darnold as the Trojans (5-1, 3-1 Pac-12) were workmanlike in bouncing back from last week’s 30-27 loss at No. 11 Washington State. Jones, who had 79 yards rushing and two receptions for 17 yards, scored a touchdown from scrimmage in his 12th straight game. 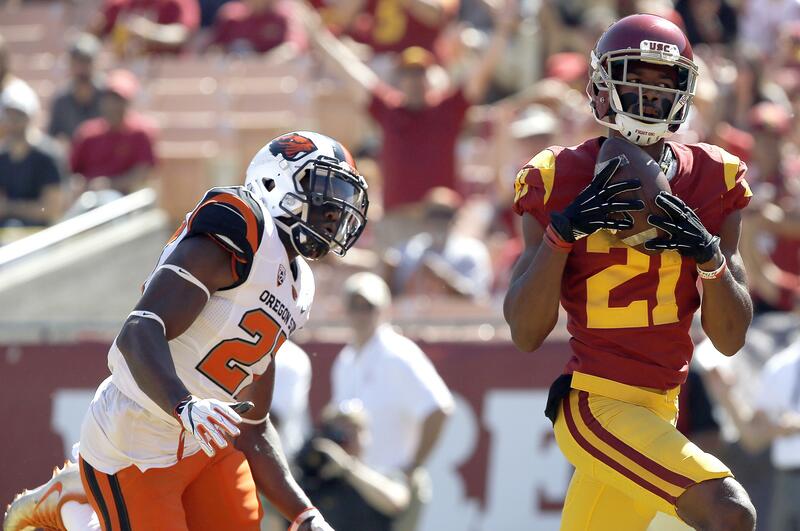 The Beavers (1-5, 0-3) recovered a muffed punt at the USC 29 and Darnold’s fumble at the USC 23 when the ball slipped from his hand while attempting a pass, but failed to score on either possession after Jordan Choukair had a 46-yard field goal blocked by cornerback Jack Jones and missed a 37-yard try wide left. Choukair did make a 33-yard field goal in the second quarter. Artavis Pierce rushed for a 6-yard touchdown in the fourth quarter and had 60 yards in place of starter Ryan Nall, who did not play due to a sprained left ankle. Darell Garretson was 16 of 29 passing for 197 yards and was intercepted by Jones on Oregon State’s first drive. Linebacker Manase Hungalu made his fourth career interception when he jumped a corner route intended for Vaughns. USC was without right tackle Chuma Edoga for the second straight game because of a high-ankle sprain. Freshman Andrew Vorhees made his first career start in place of right guard Viane Talamaivao, who is out for the season after tearing his pectoral muscle against the Cougars. Darnold’s backup Matt Fink rushed for a 51-yard touchdown in the fourth quarter. The score allowed long snapper Jake Olson, who lost his eyesight at age 12, to play for the second time this season on the ensuing extra point. Arizona 45, Colorado 42: Backup quarterback Khalil Tate rushed for 327 yards, the second-most in school history, and accounted for five touchdowns to help the Wildcats (3-2, 1-1 Pac-12) hold off the Buffaloes (3-3, 0-3) in Boulder, Colorado. Stanford 23, Utah 20: Bryce Love ran for 152 yards and a touchdown and the Cardinal handed the Utes their first loss of the season. Utah bottled up the nation’s leading rusher for most of the night, but the Cardinal (4-2, 3-1 Pac-12) faithfully continued to give their star the ball. On his 18th touch, the 5-foot-10, 196-pound speedster made two defenders miss in the hole and ran away for a 68-yarder that put the Cardinal up 23-13 with 12:02 remaining. Utah (4-1, 1-1) stormed down the field on the ensuing possession with Troy Williams hitting Darren Carrington for big gains, but an interception essentially ended the game. The Utes had moved to the Stanford 30 and Williams was about to be sacked when he threw the ball up downfield. Quenton Meeks picked off the fluttering pass and allowed Stanford to work more time off the clock. Williams threw another interception to Justin Reid with 5:52 remaining. Keller Chryst threw for 106 yards and ran for a touchdown for Stanford. The senior got the start after missing last week with an undisclosed injury. He began the season as the starter, but was hurt two weeks ago against UCLA, and sophomore K.J. Costello helped lead the team to its first two Pac-12 wins. Both played Saturday and Costello threw for 82 yards. Williams completed 20 of 39 passes for 238 yards, one touchdown and two interceptions. Utah running back Moss had 79 rushing yards and a touchdown on 15 carries, and Carrington had 99 yards and a touchdown on seven receptions. Sunia Tauteoli had 11 tackles and 3 1/2 for loss for Utah. Stanford led 13-10 at halftime after Jet Toner hit a 46-yard field goal with 6 seconds remaining in the half. The Cardinal didn’t have a turnover and put the game away with the two interceptions. Published: Oct. 7, 2017, 5:34 p.m. Updated: Oct. 7, 2017, 11:11 p.m.